Sway Bars for your R60 MINI Countryman S and ALL4. If you want to enhance the handling of your MINI Cooper S the rear sway bar should be your first stop. It is the biggest bang for the buck mod you can do to your suspension. A rear sway bar will improve handling, make the car more neutral and keep it flat in the corners. 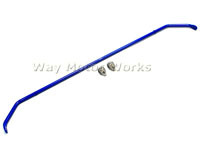 WMW carries sway bars from Hotchkis, Hsport, Ireland Engineering, Alta, H&R, NM Engineering and TSW.